The new system used feeds from a myriad of sources and I can easily add more. Basically each feed builds up whatever data it can into a central summary object that then reports it all out. It uses the Lat/Long to calculate the sunrise and sunset times as well as the moon phase. It computes some averages and spits out the whole thing on a web page or in an email. The sample below is taken from http://www.ccga12.org/weather/ which was the main reason I created it - however I bet anyone cruising the waters of the Straight of Georgia may find that page useful. It updates as soon as the various stations do - so the information is as current as it can be. It even includes satellite and web cam images (not shown) that update automatically as well. Thanks for the info - I´m sure others will appreciate it as well. I´ll certainly have a look at that. 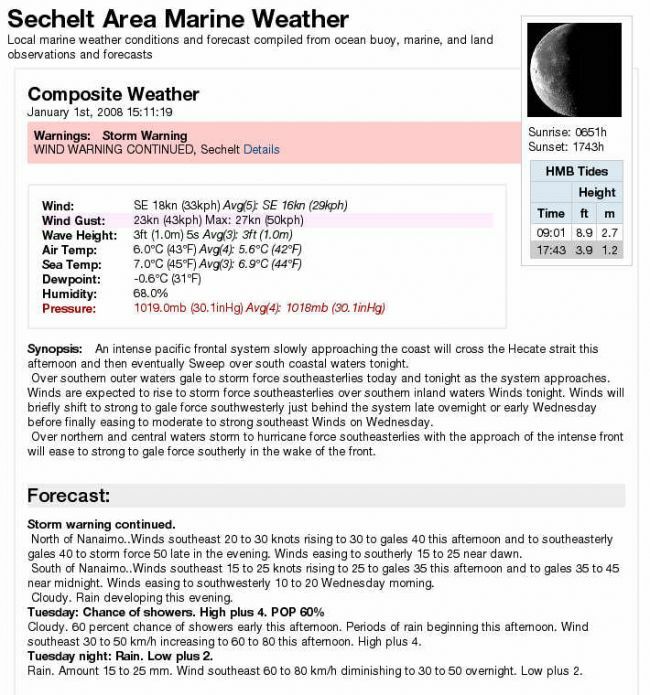 I´m actually thinking of creating some weather pages similar to the screenshot for a selection of coastal ports in the US and Canada and then add them to a list of weather resources here. If I get to doing that I might do a bit more research using this info first. I neglected to give you another related link yesterday. It is usually supplied to those who have finished the course that I mentioned, but may be of interest to you as a research source. It has links for Canadian sources under the international sub-section. There are a variety of things provided there including sea ice. It is a good jumping off point for weather materials. You have started out on a grand project. You are certainly not one who is short on ambition. I had my introduction to meteorology in the early 1960´s both the academic at the Academy and the practical at sea. You have seen a couple examples in my photo posts. During the years that I taught secondary school I also took some more formal courses. The art has changed immensely since I first started. The last course that I took was for graduate credit, but was provided by the American Meteorological Society. It is called "Real Time Forecasting". It is written such that it is of value to both those with experience in the field and beginners. It is taken on-line with printed support materials and periodic trips to a sponsoring college. Perhaps the best part is the on-line site that is provided. It has the daily assignments and downloads as expected, but, in addition, it has a whole range of additional resources. These resources are kept up to date continuously, even during the time that the course is not actually running. I really encourage you to take a couple of hours to explore the site in detail. The radar, water vapor, upper atmosphere, satellite feeds, and more can keep you busy for quite a while every day if you let it. You can even try the online lessons, but will lack the printed materials that fill it out. I don´t know if there is a Canadian version of the course, there may well be, but if you have any readers in the US who are in education and want 3 sponsored graduate credits and some real information about weather, they should consider applying for the course. Free courses that have real value can be hard to come by. Information is also on the site. I am now in my eighth year of retirement and have no connection to the AMS, so have no interests other than good will in making this recommendation. 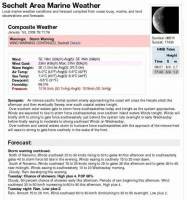 The course served me well, and the site gives me good weather information every day.